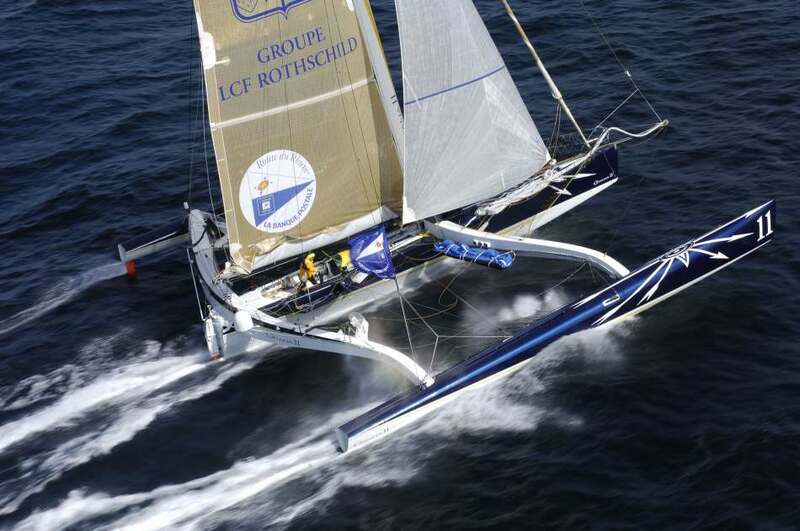 After dominating the MultiCup, Franck Cammas on Groupama 2 was favourite for the Route du Rhum, but it was Lionel Lemonchoix, on Gitana 11, who took victory and shattered Laurent Bourgnon’s record, by 4 days, 15 hours, 22 minutes. Lemonchoix modestly said he was helped by weather conditions that allowed him to sail a, more or less, direct route. The race had a fair number of casualties, the first being Vincent Riou, on day 1. The last Vendée Globe winner had been sailing under solent and full mainsail, in 15 to 20 knots of wind, when PRB’s mast broke. Next day, Jankees Lampes Class 3 monohull, La Promesse, also dismasted and Marc Lepesqueux (Siegenia - Aubi) broke his port rudder in a collision with a baulk of timber. November 1 saw the first capsize; Charlie Capelle’s Acapella, or Switch.fr, as it had been renamed for the sponsor. Falmouth Coastguard believed the EPIRB registration for Acapella and CROSS Gris Nez were told that Switch.fr was in trouble, so it took a while before French and British coastguards realised they were only co-ordinating one rescue, not two. Capelle was rescued by Luc Coquellin. Next day, Didier Levillain, on board a sinking A Fond Contre la Spondylarthrite, sent out a MayDay and was rescued by a cargo vessel. Falmouth Coastguard was, at that time, also co-ordinating the rescue of a British couple from their cruising yacht, in Biscay. 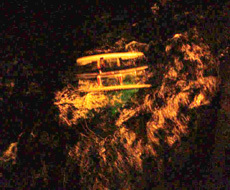 The vessel that picked them up was the ill-fated MSC Napoli. 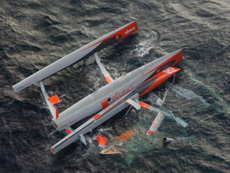 Another November 2 casualty was Steve Ravussin, whose Orange Project hit a container, lost its main rudder and headed for the Azores. He effected repairs and set off again, but left an upturned Orange Project, in mid Atlantic, for the second time in two years, when the tanker Oktah Bridge rescued him! Ideal Stelrad was next to flip; British yachtsman, Ross Hobson, was picked up by the cargo vessel Carmen. 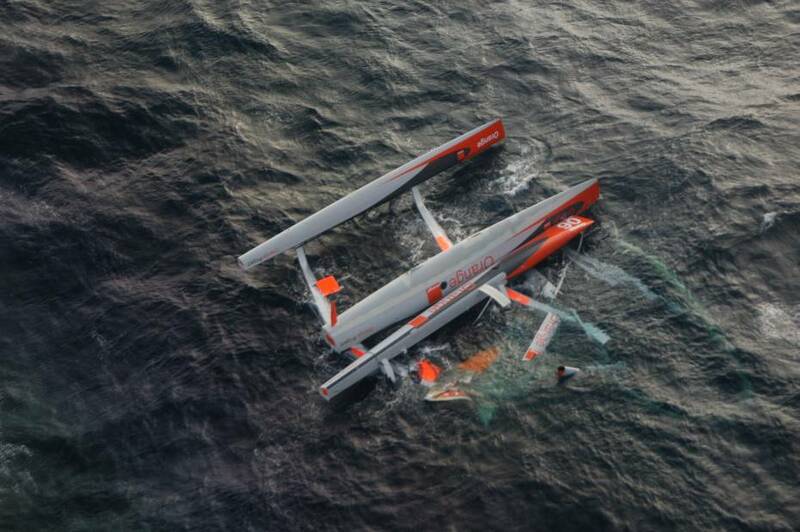 Next casualty was Joé Seeten, on TMI Technologies, who sent out a MayDay, 640 miles south west of the Azores. Seeten had an injured shoulder and the yacht was taking on water. MRCC Norfolk described the situation as “nasty”, with the nearest commercial vessel, the Stavanger Eagle, some 4 hours steaming distance away and the yacht in gale Force 8. The cargo vessel was concerned that she might only be able to give limited assistance, as she had no boats to lower. BYM News stayed in phone contact with MRCC Norfolk and the ship’s master and reported events, in English and French, until the Stavanger Eagle had Seeten on board, after an extraordinary piece of seamanship. The reward came next day, when Seeten’s shore team said “Thank you BYM News, we only knew what was happening thanks to you.” One of those times that running a news service makes you feel good!